Let me be straight, I’m not an EDC goer, I don’t hang in the Sahara tent or Oasis Dome at Coachella, I don’t even know the difference between trance and house. (Wait… is there a difference?) I’ve only just figured out what dubstep is, and I don’t get its appeal. At all. Point being, I’m not qualified in the least to give the lo-down on any show that involves glow sticks, pacifiers, furry boots, or ridiculous plastic PLUR (people-look-ugly-rolling… oh my bad, it’s peace-love-unity-respect – whatever) bracelets. 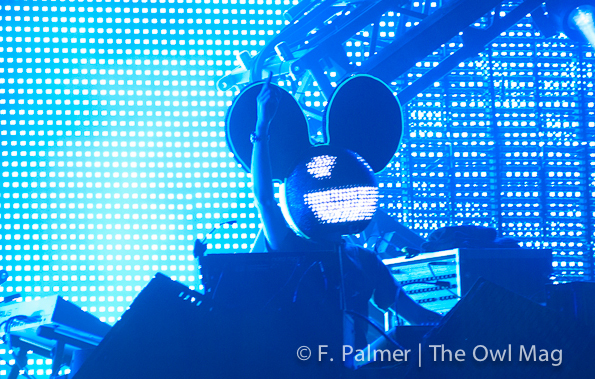 So why did I choose to experience Deadmau5’s third sold-out show in Los Angeles Sunday night? Because I passively caught the last five minutes of his set at Outside Lands in San Francisco, and I wish I had been there in its entirety. 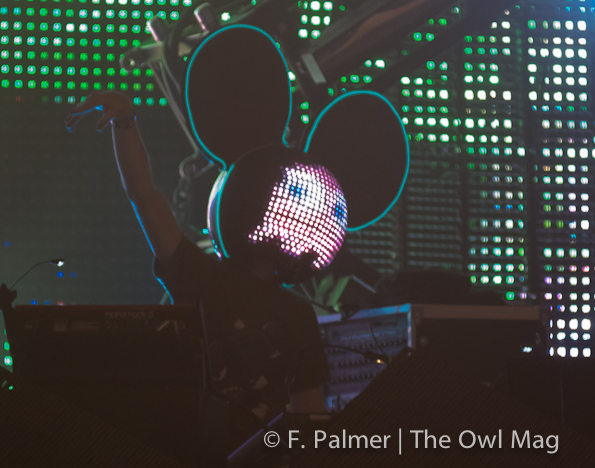 In those five minutes I was bitten by the energy of the audience, and I wanted to experience Deadmau5 from his first tickle to his last kaboom for myself. 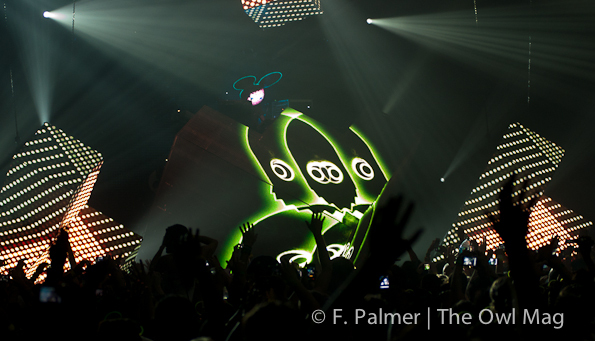 The Hollywood Palladium served for the perfect venue in its circular spiral wonder crawling with ridiculously excited mini-mice (girls prancing around in circular glow-stick ears). 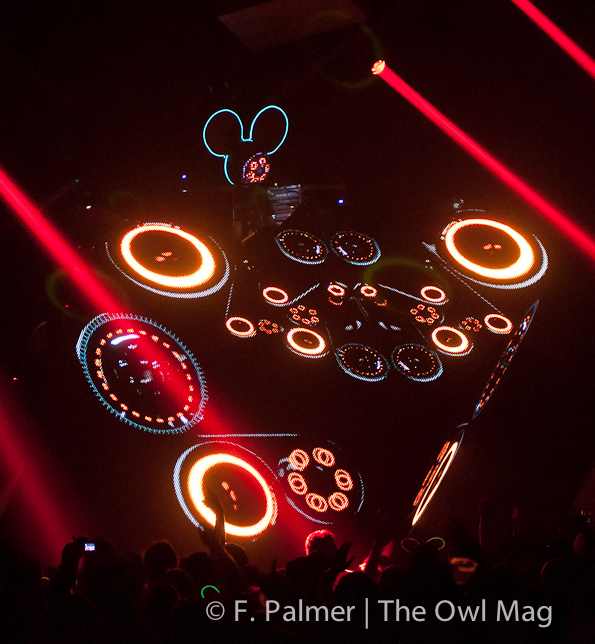 At the stroke of midnight exactly Deadmau5 started his set with simple, yawn-inducing beats which eventually swelled with energy from the ferociously intense electronic light displays and fist pumps (Jersey style, yo) like a whip-cream covered balloon about to burst. 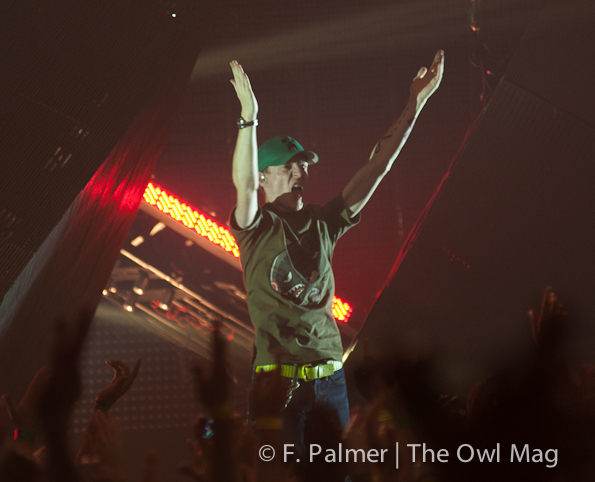 After exactly one hour of spinning his more “dancey” mixes from atop his high-rise geometric platform, the Palladium twisted into a west coast version of Hurricane Irene with a fierce dubstep mix that turned the venue inside out. Let me be straight… I loathe the wobbly inconsistent altered noise of dubstep, but two vodka cranberries and a mesmerizing light show later, and even I was a mousakteer! I couldn’t believe my body was moving to that sound, and it was. Hard. I don’t see it ever happening again, but that’s the power of this DJ. 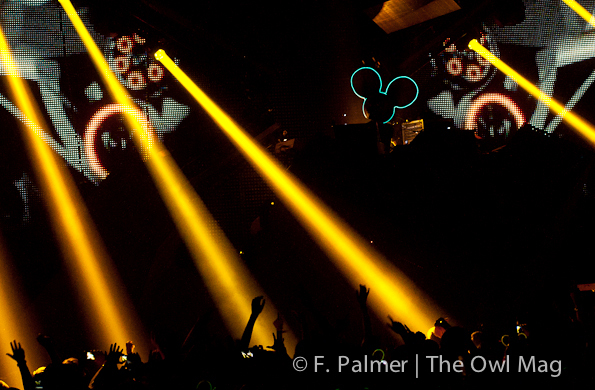 Deadmau5 is intoxicating. The hypnotic light show of singing mice, Rubik’s cubes, Pac-Man Ghosts, lightning, starbursts, strobes, etc. 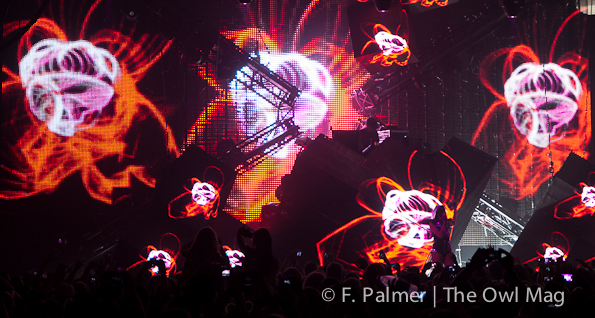 coupled with the ferocious electronic waves of sound are seriously something for the senses to behold. If one can get past the… well… eh screw it, there was honestly nothing to diss about this night’s unforgettable raw energy. I was seduced by everything about it and wouldn’t hiccup at the chance to be wrapped up in it again. 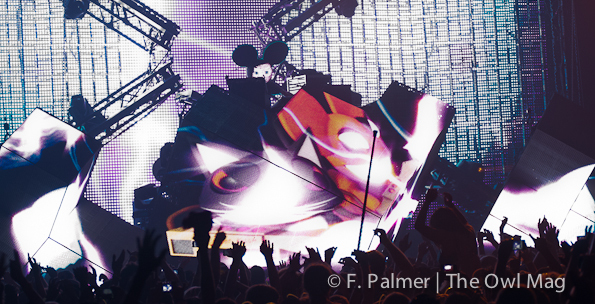 Click HERE for more amazeballs photos of Deadmau5!